How do you keep parts from moving while glueing? 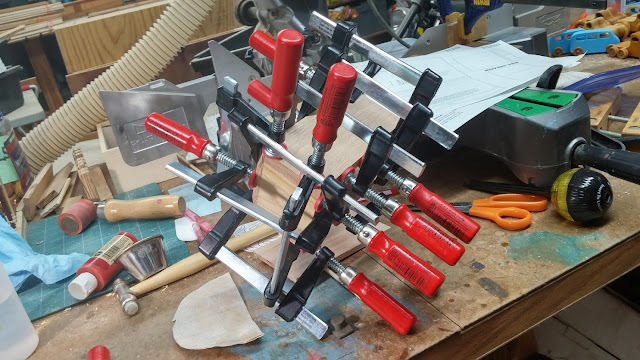 I usually just add more clamps. Several of the clamps in the photo are there to hold the pieces aligned. It can get a bit messy at times but I keep my tools including clamps waxed with Johnson's Paste Wax threads and all. Glue just pops right off. A little tiny pinch of clean fine sand sprinkled on the glue helps a lot. I would not do this if you are going to drill or cut later. I'm not fond of having to keep a bag of sand around. Some people use salt instead of sand. I've always been leery of this. It might change the chemical composition of the glue or wood and do something undesirable. I have never tried this. Dowels, pins, etc can be used to keep things aligned but they add extra steps. You could use a pin nailer for some things but you have to keep it from moving while you put the pins in. Might as well clamp it. The thinner the coat of glue is the less of a problem you will have. This is tricky for me. The thinner the glue gets the more likely the joint is to fail. I always get to much. I've seen it recommended to use a dab of CA glue along side the wood glue. This probably works. I don't use it because I'm not a fan of CA glues because they are expensive and always seem to set up on me or clog the tip before I use them up and so I wind spending a dollar or two per joint. They also have a short shelf life. Dry fit everything you can. That is put it together and clamp it up without any glue. Else one day you will find yourself with a ruined toy because you didn't have enough or the right kind of clamp you need. You can make clamps for special needs. Some times cauls or wedges are what you need. These are shop made and and may not be worth the trouble for a one of a kind toy, However, if you are going to make a lot of the same toy building a clamping jig can be very beneficial. Bottom line is: Use lots of clamps! As you gain experience you will get a feel for what clamp to use and how much pressure you need to apply.